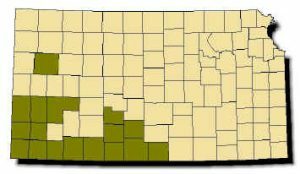 Range: Found in southwestern Kansas south of the Arkansas River; an isolated colony exists to the north in Logan County. Description: Harmless. Smooth scales. Upper surface of body yellowish-cream with 18–35 black blotches separated by pink or reddish interspaces; white, unpatterned belly. 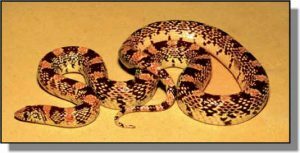 At least half the scales on underside of tail not divided into two rows, a characteristic not found in any other harmless snake in Kansas. Young look like little adults. Habits: Active from April to September; prefers open prairies, sandy regions and beneath rocks on the slopes of rugged canyons. Breeding occurs in spring; from 4-9 eggs are laid in June and hatch in August or September. Constrictor. Feeds on insects, lizards, smaller snakes and small rodents.